POLE DEDICATION: VFW Post 910 member, and 22-year Air Force veteran, Ray Bahney Sr. salutes the flag as his son, and VFW Post 910 member, Ray Bahney Jr. raises it. The pair was at St. Joseph Catholic Church for a short ceremony and pole dedication. 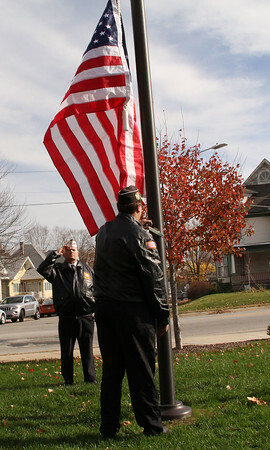 The church dedicated three new poles on Veteran’s Day.